WASHINGTON -- A Dutch attorney who lied to federal agents investigating former Trump campaign chairman Paul Manafort was sentenced Tuesday to 30 days in prison in the first punishment handed down in special counsel's Russia investigation. He was also ordered to pay a $20,000 fine. 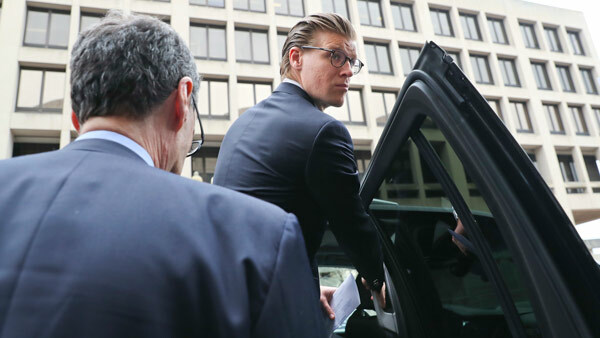 Alex van der Zwaan's sentence could set a guidepost for what other defendants charged with lying in special counsel Robert Mueller's investigation may receive when their cases are resolved. Among them are a former White House national security adviser and a Trump campaign foreign policy aide. "There were not mistakes. These were lies," Jackson told van der Zwaan as he stood before her. "This was lying during the course of a federal investigation," she added, noting that being able to "write a check and walk away" would not fit the seriousness of the crime or send the right message. The criminal case against van der Zwaan is not directly related to Russian election interference, the main focus of Mueller's probe. But it has revealed new details about the government's case against Manafort and opened a window into the intersecting universes of international law, foreign consulting work and politics. The case has also revealed previously undisclosed connections between senior Trump campaign aides, including Rick Gates, and Russia. Just last week, the government revealed that van der Zwaan and Gates spoke during the 2016 presidential campaign with a man Gates had previously described as having ties to the GRU, Russia's military intelligence agency. Gates is now cooperating with Mueller. During a 40-minute hearing Tuesday, van der Zwaan made only a brief statement, telling Jackson, "Your Honor, what I did was wrong. I apologize to the court. I apologize to my wife." Van der Zwaan admitted in February to lying to federal agents about his contacts with Gates and the person with ties to Russian intelligence. Though prosecutors did not take a position on whether he should be locked up, they stressed that he had lied "repeatedly" to investigators. On Tuesday, Jackson said she recognized that van der Zwaan has been away from his family for months, during which his wife is going through a difficult pregnancy. But the defense's attempts to paint him as a tragic figure didn't ring true, she said. "This is not something that happened to him. He did not suffer unavoidable circumstances of tragedy. This is something he did," she said. Jackson also said his signs of remorse were relatively "muted." He didn't write a letter to the judge, as his family and friends did, and hasn't used his time in the U.S. to perform community service or other actions to make up for his actions, she said. The sentencing came just hours after prosecutors revealed that Deputy Attorney General Rod Rosenstein had in August explicitly authorized the Justice Department's special counsel to investigate allegations that Manafort colluded with the Russian government. Rosenstein's decision was disclosed in a memo attached to a court filing late Monday. Manafort, who led the Trump campaign for several months in 2016, has challenged Mueller's authority and asked a judge to dismiss an indictment charging him with crimes including money laundering conspiracy and false statements. He said Mueller, who was assigned to investigate potential coordination between Russia and the Trump campaign, overstepped his bounds by charging him for conduct that occurred years before the 2016 presidential election. The memo, which had not previously been released publicly and remains redacted in parts, said that Mueller was empowered to investigate allegations that Manafort "committed a crime or crimes by colluding with Russian government officials" to interfere with the presidential election. None of the charges Manafort currently faces alleges coordination with the Kremlin, and Manafort's attorneys had used that point to argue that Mueller had exceeded his authority by bringing charges against him accusing him of various financial crimes and acting as an unregistered foreign agent on behalf of Ukrainian interests.